The road to a Senate majority is going to go through eight states — Alaska, Colorado, Georgia, Iowa, Kansas, Louisiana, New Hampshire, and North Carolina. Most experts are predicting Republicans will take control of the Senate this evening. That’s because the GOP needs a net gain of six seats to win a majority and, at this point, polls show they are set to make four of those pickups — Arkansas, Montana, South Dakota, and West Virginia. Around 8:30 p.m. ET, multiple outlets called Arkansas’ race for Republican Rep. Tom Cotton, who knocked off incumbent Democratic Sen. Mark Pryor. Earlier in the night, the West Virginia race was called for Rep. Shelley Moore Capito, who beat Democrat Natalie Tennant. This means Republicans need to win just two tossup races in states that currently have Democratic Senators. Of course, this assumes they can hold on to their red Senate seats in the competitive Kansas and Georgia races. Kentucky was also supposed to be competitive, but Republican Senate Minority Mitch McConnell was declared him the winner there shortly after the polls closed there Tuesday night. With his win, if the GOP takes the majority, McConnell is expected to become the next Majority Leader. That leaves these eight states as the ones with close races where a seat could change hands. Below is a list of the crucial races that will decide the Senate in order of when the polls close and results will begin coming in. Democratic incumbent Jeanne Shaheen race has long been considered the favourite to win re-election in New Hampshire, but the well-traveled Scott Brown is mounting a late comeback. Shaheen leads an average of six recent polls by less than a single point. And the gap has tightened considerably from when she held a 10-point lead in late August. President Barack Obama is not popular in the state, something that has been a drag on the relatively well-liked former governor Shaheen. Brown has tried to exploit Shaheen’s ties to the president over the last two months on foreign -policy and national-security issues, including the war against ISIS and the Ebola crisis. New Hampshire already has one Republican senator in Kelly Ayotte. If its other seat turns red, it’s going to be a tough night for Democrats. Polls in New Hampshire are set to close at 7 p.m. Eastern. Democrat Michelle Nunn, the daughter of former Georgia Sen. Sam Nunn, may be the Democrats’ best chance to pickup a red seat tonight. Most recent polls have shown Republican David Perdue with a slim lead over Nunn in the race to replace retiring Republican Sen. Saxby Chambliss. However, a CNN/ORC poll released October 24 found Nunn three points ahead of Perdue. If Nunn does pull off a victory, it would help Democrats force Republicans to win three states and defend two to gain the Senate majority. However Georgia might not be decided tonight. The state’s election laws call for a runoff if no candidate is able to get over 50% of the vote, so that is the key number to watch for. Most polls of the race have indicated neither candidate will pass the crucial 50% threshold. Georgia’s runoff would be scheduled for January 6. This means that, if the Senate majority ends up depending on Georgia, we might not know who controls the upper chamber of Congress until next year, days after the new session is scheduled to begin. Results from Georgia will start coming in after the polls there close at 7 p.m. Eastern. North Carolina’s Senate race has become the most expensive in history, as Republicans made it an early target to swing from blue to red. However, Thom Tillis, the preferred candidate of the GOP establishment, has struggled against incumbent Democratic Sen. Kay Hagan after fending off a Tea Party challenge. After more than $US100 million spent on the race, according to the Sunlight Foundation, Hagan and Tillis are virtually tied — Hagan leads an average of recent polls by just 0.7 points. Tillis has narrowed the gap in the past two months, using the familiar GOP playbook of tying Hagan to Obama. But Hagan has exploited the unpopularity of the state legislature where Tillis is speaker of the House. The state saw record early-voting numbers ahead of Election Day, and turnout was up about 20% from the 2008 midterm elections. Some key voting blocs, including African-Americans, also posted turnout numbers in early voting that were much larger than 2008. The shifting fundamentals of the North Carolina race — and the deficits across the map elsewhere — have made North Carolina a virtual must-win for Democrats if they are to have any shot of keeping control of the Senate (or if they want to avoid a landslide). A victory here and no losses in the three competitive states where they’re playing defence would put the GOP one win away from taking the Senate. Polls in North Carolina close at 7:30 p.m. Eastern. One of the most fascinating pairs of elections comes in Kansas, the stalwart red state where Republicans are nevertheless in trouble in both the US Senate and gubernatorial races. Incumbent GOP Sen. Pat Roberts and independent candidate Greg Orman have been separated by no more than 2 points in the last five polls of the state. Roberts has significantly closed the gap with Orman over the past two months, turning what was once a double-digit deficit into a statistical tie. But he has been unable to pull ahead over the past few weeks. Orman, an independent, is something of a wild card. Most strategists believe he would choose to caucus with Democrats, since he briefly ran for Kansas’ Senate seat in 2008 as a Democrat. If Roberts loses, it could complicate the GOP’s path toward a Senate majority as this is one of the three states with close races where they’re playing defence. Results from part of Kansas will start coming in at 8 p.m. Eastern and the polls in other areas close one hour later. The state’s gubernatorial race also has potential national implications. Fellow Kansas Republicans have revolted against incumbent GOP Gov. Sam Brownback, who was once viewed as a candidate with presidential potential. His tax “experiment” has divided Kansans who elected Brownback by a 30-point majority in 2010. Now, Brownback trails Democrat Paul Davis by an average of 2 points in the latest polls. The Rocky Mountain state is another place where Republicans have a chance to pick up one of the seats they need to take Senate control. Colorado’s incumbent Democratic Sen. Mark Udall spent much of the summer ahead of GOP Rep. Cory Gardner, however, since late September, polls have showed the Republican emerging with a slight lead. Udall has tried to fight off the challenge by focusing on Gardner’s opposition to abortion. Gardner has countered by trying to paint Udall as a single issue politician and touting his support for the Keystone XL pipeline. Polls in Colorado close at 9 p.m. Eastern. Louisiana is one of two states — along with Georgia — where things could get interesting. It is almost certain to head to a runoff — party officials on both sides are fully preparing for such a situation. The likely matchup is Democratic incumbent Sen. Mary Landrieu and Republican candidate Bill Cassidy. Though Landrieu currently leads the three-way contest in polls, she would trail either Cassidy and Tea Party favourite Rob Maness in a head-to-head runoff matchup giving the Republicans one of the pickups they need. The Republican National Committee said Tuesday it’s seeing an increase in Louisiana Democrats voting for the Republican candidates in early voting. 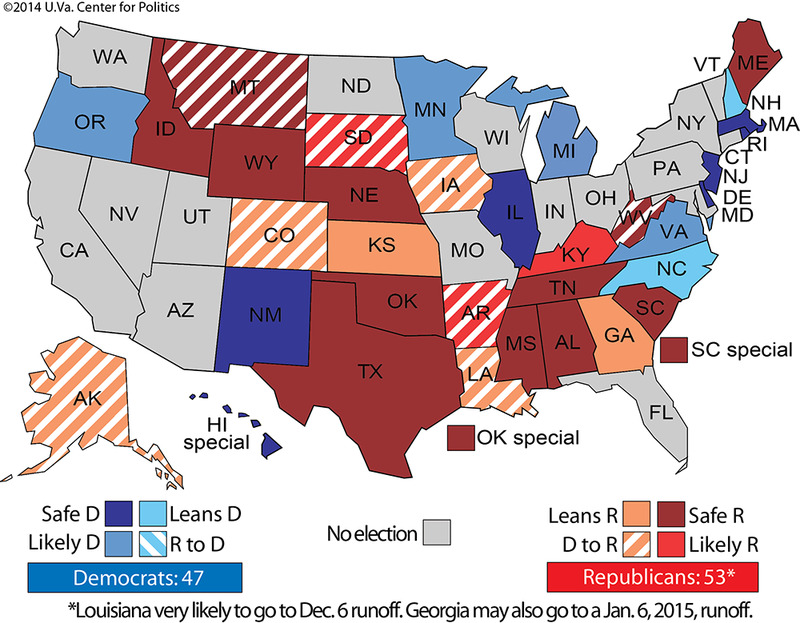 Louisiana’s runoff would be held on Dec. 6. Theoretically, if Republicans are unable to cleanly come away with Senate control Tuesday night, it could the runoffs in Louisiana and possibly Georgia could prove decisive. When Ernst’s ad hit the airwaves, Democratic Rep. Bruce Braley had a wide lead in their race. However, starting in June, polls began to show a razor thin lead going back-and-forth between the two candidates. Some observers have credited Ernst’s surge to her viral hog farm ad. However, Braley has also suffered a series of damaging gaffes including a series of controversial comments he made about farmers. Ernst and Braley are vying to replace retiring Democratic Sen. Tom Harkin, which means Iowa could give the GOP one of the seats they need to switch to take the majority. The political class is likely praying the election doesn’t come down to Alaska as polls there don’t begin closing until midnight on the East Coast. Voting in Alaska won’t be complete until 1 a.m. Eastern on Wednesday. However, the race between the state’s Republican former attorney general Dan Sullivan and Democratic Sen. Mark Begich is a close one, which means it could be a late night for election watchers if the GOP hasn’t locked down a majority without a pickup in Alaska. Polls have been somewhat divided in Alaska with Sullivan having had a solid lead that was seemingly erased by a few recent surveys that favoured Begich. Furthermore, there’s been a long history of questionable polling in Alaska making the race even more of a question mark. This post will be continuously updated throughout the night.